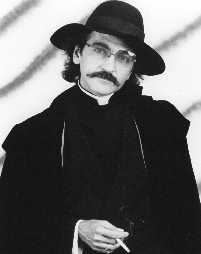 FATHER GUIDO SARDUCCI has spent the past twenty years living and working in the United States as gossip columnist and rock critic for the Vatican newspaper L'Osservatore Romano. Recently, he was also appointed Assistant Managing Editor for the Vatican Inquirer. American audiences first became familiar with Father Sarducci during the "golden years" of "Saturday Night Live," when he appeared regularly as a commentator (and occasionally as a correspondent) on "Weekend Update." He's also been a frequent and welcome guest on "The Tonight Show" (with Johnny Carson and Jay Leno) and on "Late Night with David Letterman." Well, as you all know, the Pope is a little under the weather. So, they asked me to step in and give the sermon this morning. The Pope, he's one amazing guy. I remember when he came to New York. He gets picked up at the airport by a limousine. He looks at the beautiful car and says to the driver, "You know, I hardly ever get to drive, can I drive?" The driver, he can't say no to the Pope, so the Pope gets behind the wheel, and the limo driver climbs in back. The Pope is a speed-demon, hits the gas and goes about 100 in a 45 zone. So, a cop pulls him over, goes up, looks in the window, and runs back to his squad car, and radios headquarters. He says, "I just pulled over somebody really important". What do I do? Well, they say, "give the guy a ticket". I can't do that, he is REALLY important! "What", they say, "more important than the Governor, or the President?" "I dunno," says the cop, "but he's got the POPE drivin' for him!" When the Pope was a young priest, he was hearing confessions one Saturday in his small church in Poland, and a drunk comes in, and goes in the confession box next to him, sits down, and says nothing. The Pope coughs to attract his attention, but still the man says nothing. So, the Pope, he knocks on the wall a couple of times, trying to get the guy's attention. Finally, the drunk says: "No use knockin', there's no paper in this one either." Personally, I like to think of them as the "Ten Suggestions", because God, well, he didn't use the word "Absolutely" in any of them. I know you'll all join me in wishing the Pope a speedy recovery. We all miss him, especially on Friday afternoons at "The Roman Collar Bar & Grill" on Vatican Street. It's not the same there without him. Now, we're gonna' take up the collection, so all of you reading this at home, just hit the PayPal button, and remember to be generous. Cigarettes are really getting expensive. Have a great Sunday. Dominic, go frisk 'em.